Tom Rutherford isn't a huge guy when you're looking at him. However, when you're talking with him you see a whole lot more to the man and he is then almost bigger than life. First of all, he's really a kind man which only adds to the strength of his character. 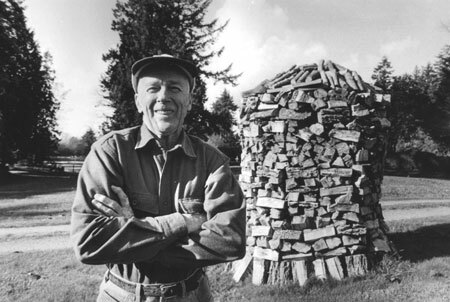 Secondly, he knows how to work hard, for example he labored diligently at Bellingham's Georgia Pacific for over 45 years and then he retired in 1993. He was compelled to keep working and today Tom's Sharp Shop is his tool, saw and knife sharpening business on his stunning homestead beside California Creek. Tom, who originally was a Methodist, now attends Grace Lutheran Church regularly. He is also a "patriotic to a fault"
type of guy, who climbed up a 140 foot tall Douglas Fir tree on his property and put an American flag on top. This half Norwegian, Scottish and French local celebrity now has his driveway officially named Rutherford Lane on our city street map. This self sharpening saw man also stacks a real mean wood pile in a most unusual design. He used his tall orchard style ladder to carefully put the top pieces in an artistically arranged and strategically interwoven placement pattern.